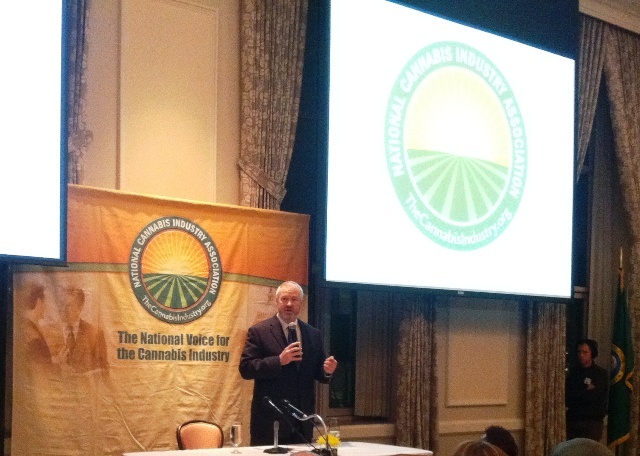 The National Cannabis Industry Association (NCIA) held its first educational event in Seattle at the swanky Washington Athletic Club on January 28, 2013 with special guest Mayor Mike McGinn. While the mayor tried to play off as any other meeting with a trade association "like the Realtors or something", the press presence loomed large, making it difficult to ignore the historic nature of the post-prohibition business meeting. McGinn's message to the industry was positive, but also reinforced the importance of the industry being good neighbors to everyone else. After all, 45% of the voters in Washington state voted against I-502. The mayor suggested that the best way to proceed was to be "really thoughtful of the concerns of others." And this would seem to include the concerns of the Federal Government. McGinn was excited - almost exuberant - as he spoke about the possibilities of the legal marijuana industry. He gushed about the local music scene and the new micro-distilleries springing up across the state. But as much as he wanted to share the wealth, he did caution that cannabis tourism touched on interstate tourism (and other stuff squarely in the camp of the Feds) and that avoiding such sensitive areas was the best way to avoid the attention of the Federal government. Some of the folks in McGinn's camp seem ready for any such Federal showdown. One such ally, representative Roger Goodman (D, Kirkland), an attorney, stood by during the question and answer session to assist McGinn with questions. He said he was willing to argue the case before the US supreme court, if needed. McGinn was the first mayor of a major US city to come out in support of full on legalization of marijuana. As he explained it, he didn't even realize the pioneering nature of his stance; while running for office he made some statement about how if everybody who held office that had ever tried marijuana was to vote for legalization it would be legal. It didn't come up again until after he was elected. A few points were clarified throughout the evening. Vending machines will not be allowed under I-502. Existing medical marijuana vendors will not be grandfathered in and issued retailer's licenses (they won't necessarily be excluded, but they aren't guaranteed a retail license). Existing dispensaries not adhering to the 1000 foot rule specified in I-502 are not exempt from the 1000 foot rule, so the opening of retail 502 stores may bring enforcement to non-compliant medical vendors. Overall, the tone of the evening was positive and upbeat. McGinn took time to marvel at how quickly legalization of cannabis was progressing. He realized that we have arrived at a "new normal". McGinn, a resident of Greenwood, remarked on the proliferation of medical marijuana dispensaries in his own neighborhood. "They're really putting the green in Greenwood." During opening remarks, Aaron Smith of the NCIA reminded attendees that "before it was an industry it was a movement". 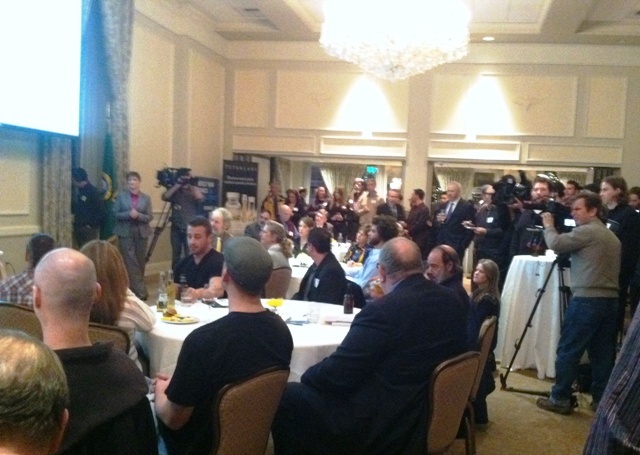 McGinn encouraged attendees to let the progressive values of Seattle help shape the new legal cannabis industry. He called out the traditional values of Seattle - local, crafted, authentic, small provider/not big chains, no GMO, fair trade - and called on the founders of the new industry to use the values that shaped our local heritage as we create the world of legal cannabis. As the mayor himself said, "We can't ask for anything else but to be good neighbors". A Timely, well written, professional account of the evenings proceedings. Thank you Smokey for the review of the meeting for all the interested people who weren't able to attend and documenting these Historical times of post prohibition. Thank you for keeping an eye on'em and representing for those of us who would have a say in the implementation of this law, but just might not be allowed into the WAC. And what a surprising place to hold this meeting!. One could argue that it doesn't get much more establishment than there. Per HeadI guess about this the best blog I have read all this hour.